Before the launching of the online casinos in the 1990s, the only way to play video poker was to go to a land-based casino or to a place which had these machines. However, nowadays this is not the case as you can enjoy this game without having to leave your home. What is more, it is even possible to play it at the most convenient time and place for you thanks to the many mobile casinos. Since they have proven to be convenient, secure and easy to use, it is no wonder that they gain popularity so much. Most mobile platforms are compatible with a number of modern smartphones, including the ones that use an Android operating system. This shouldn’t be much of a surprise, taking into account the fact that Android-based devices are among the most widespread smartphones that are used by hundreds of people from all over the world. Regardless of whether you have HTC, LG, Samsung, Nexus, Sony Xperia or any other Android phone, you will be able to enjoy a number of video poker variations and experience the game on the move. Playing video poker on any of the above-mentioned mobile devices is easily achievable as most mobile casinos support this operating system. In most cases all that you need to do is to simply open the casino’s website on your smartphone and log into your profile. As you might already know, Google Play Store is the virtual market from which Android users can download different types of apps. Thanks to it, you can install various apps on your phone and access websites much faster and easier. Unfortunately, up to the present when it comes to apps which feature real-money gambling, you won’t be able to find any on Google Play Store. They are considered unsuitable for Android users and as a result, forbidden. You can still download video poker apps and enjoy the game but you won’t be able to bet and win real money. However, you shouldn’t be misled by this fact and think that since no such apps are offered, you cannot gamble by using your smartphone. As long as the country you reside in allows online gambling, you can access a number of casino websites trouble-free and enjoy video poker whenever and wherever you are. As previously indicated, most online casinos have developed a mobile platform which is compatible with various modern devices, including all types of smartphones and tablets. Moreover, most fully-licensed casinos offer an instant play mode which enables you to play directly from their website, without the need to download any software. Being able to play video poker on your Android-based smartphone surely gives you a number of benefits. Perhaps one of the biggest advantages is that you can entertain yourself from any place by playing video poker. Thanks to the mobile casinos, you can not only choose how to enjoy video poker but also when and where to do so. Also, most of the mobile games have outstanding graphics and quality which undoubtedly contribute to the ultimate gaming experience you are able to gain from playing them. The fact that you can play video poker by using a touch screen gives you great flexibility and it enables you to make moves faster and easier. In order to be able to make the most of every video poker game, you need to play in a reputable mobile casino which offers a wide range of high-quality video poker variations. Selecting a game that suits your personal preferences best is just as important as choosing the right mobile casino. Both aspects play a crucial role for your online gaming experience and thus, it is essential to consider them in advance. In order to help you with the latter, we will take a look at some of the most popular mobile casinos which are compatible with Android mobile devices. William Hill is a well-known online casino which has been in the gambling industry for a considerable amount of time. Its many years of experience have greatly contributed to the excellent gaming products it provides nowadays. This online casino surely knows how to meet its players’ needs and surpass their expectations when it comes to bonuses and promotions as it offers various special deals on a regular basis. Its mobile casino can be used without the need to download anything as it has an instant play mode. 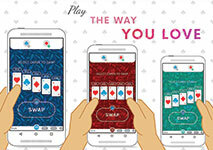 All of the games that the mobile version offers are powered by one of the most prominent software providers – Playtech. Thanks to it, you have the chance to experience various exciting games such as video poker with crisp graphics and excellent quality. All that you need to do in order to enjoy them is to simply visit the casino’s website by using your most preferred browser. Once you register and log in, you can make a deposit by choosing from a wide range of payment solutions, including Neteller, Skrill and others. One of the most innovative online casinos which attract a number of video poker players is Casinoland. Its website is very easy to navigate and it is entirely mobile responsive which enables players to enjoy their favorite game at any time and place. Its design is very simple yet pleasant to the eye which is another aspect of the mobile platform that appeals to a number of players. The first but not only priority of the mobile casino is to manage to deliver an ultimate gaming experience that highly resembles the one you usually get when you go to a land-based casino. In order to achieve this goal, it has teamed up with some of the leading software suppliers, including NetEnt, Play n’Go, Microgaming and others. This is indicative that the available mobile games not only have a huge diversity but also their quality is impeccable. If you have an Android phone, you can easily access the casino’s website and play video poker with excellent graphics and sound effects whenever you wish. All British Casino is a fully-licensed online casino which offers a wide range of top quality games. It takes great responsibility when it comes to assuring a high level of protection to its players’ data and this is the reason why it employs state-of-the-art security systems and technologies. Whenever you play video poker at its mobile casino, you can rest assured that all of your transactions will be handled in a professional and secure manner. If you are an Android user, you can enjoy video poker at All British Casino as its mobile platform is fully compatible with these mobile devices. You don’t even have to download any software as it has an instant play mode. The mobile casino aims at providing its players with nothing but the best gaming experience and it shows. It also gives you the opportunity to play video poker in fun mode, meaning that no real money is involved in the game. This way you can practise your strategy and enjoy the game entirely risk-free. In order to do so, you need to be simply logged out of your profile as this way the game won’t be linked with your account. If you want to discuss any urgent matter regarding your gaming experience, you can always contact a customer support agent who will assist you in the best possible way. Another reputable online casino which gives you the chance to play video poker on your Android smartphone is Golden Tiger. Its mobile version is user-friendly which enables you to navigate through it with ease. Most of the online games that the mobile casino offers are powered by the famous software provider Microgaming. Apart from providing high quality games, the mobile casino also concentrates on assuring high level of protection to its players’ sensitive information. This is the reason why it uses a 128-bit encryption technology in order to make sure that the transactions players make are performed in a safe manner. Thanks to this mobile casino, you can play video poker on the move and rest assured that whenever you make a deposit, your data is in good hands. Furthermore, it offers various promotions and special deals to its mobile users which significantly contribute to the great gaming experience you are able to get from playing in this mobile casino. UK Casino Club is an online casino which gives you the chance to experience video poker at any time and place you like. Along with the above-mentioned casino Golden Tiger, UK Casino Club is also a part of the big Casino Reward Group. Its mobile version is compatible with a number of modern devices, including Android and iOS smartphones. If you are a video poker enthusiast, it is handy to know that you can play either single-hand or multi-hand game. Also, you are given the privilege to try some of the exclusive video poker games which are only available to the users of this online casino. You can experience video poker in a whole new way and diversify your gaming experience significantly. In case that you have any questions or you need help, you can always get in touch with a customer support agent. You have the chance to do so by phone, email or live chat feature. Choose the most convenient time and way of contacting a customer support representative and find a solution for any problem in an instant. Nowadays almost every online casino has a mobile version which is fully compatible with a number of modern devices, including Android smartphones. You can use your Android phone to play video poker at any time and place and this way make better use of your time. It is no longer necessary to go home or all the way to a land-based casino in order to enjoy the game. Mobile casinos undoubtedly offer many advantages which contribute to the overall pleasant experience you can get from playing video poker in them.